I just wanted to say a huge THANK YOU to Lyndie - I have learned to much and will keep exploring. You have inspired me with your eternal curiosity and confidence that everything is possible. I don't think I'll ever stop learning or discovering things but it's given me a great basis from which to explore my craft. Another big thank you also go out to all the other people I have had the pleasure of working with this year. So this blog post marks the end of my year (better late then never) - I actually finished in early september but have been catching up on all the non-puppet making/performing side of things since then. 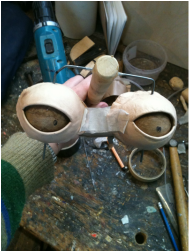 I've enjoyed writing this blog and keeping track of the things I have been doing so I'm planning to keep adding things every now and then when something interesting happens over on the page marked Puppetry - Still Exploring. In the mean time heres a little video of Lyndie talking about the puppets in the Little Angel Theatre's recent adaptation of Macbeth. So this blog post marks the end of my year better late then never - I actually finished in early september but have been catching up on all the non-puppet making/performing side of things since then. I've enjoyed writing this blog and keeping track of the things I have been doing so I'm going to keep adding things every now and then when something interesting happens. I've been sitting here taking stock of everything I've done so I'm just going to write it below for my own benefit to remember but you might find it interesting as well. There are probably things I have forgotten here but I'll add it as I think if it -but for now that's all for this page of the blog, but theres always room to keep exploring! Thank you for reading and sharing this time with me. Evan's talking to himself again. This post finds me at the end an exciting week at the lovely Jacksons Lane with amazing help from Kaveh, Chris, Hazel, Erica and Krystle. Thank you all so much for coming in and being part of it. Loosely inspired by Flowers for Algernon we started the week with lots of found stuff, some of the puppets I have been making this year, some materials to knock up some new ones and lots of energy. 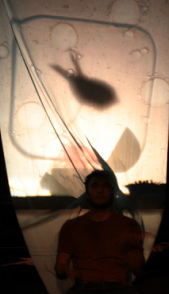 I had a lot of fun creating the work in progress and performing on Friday night. It's quite a different style from other work I have been part of - but I have to say that I was really enjoying the dark comedy/tragedy line we began to walk. I'm also working on a short video of what we achieved in this short amount of time so watch this space! 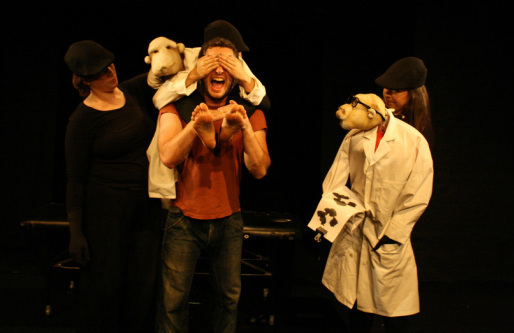 This week I have been working with a lovely bunch of people playing with puppets for our upcoming hatch performances on the 6th September just £3 to see some fresh ideas. So far my marionette from last year has gone from being the star to being cut and replaced by some doctors who are definitely up to some monkey business. All shall be revealed soon. See you on the 6th! We started with materials and moved up though head with carrier bag bodies, then these little guys then up to full sized lip sync puppets. Talking + character improve = Scary! but it was definitely great to have a go in a safe environment with just Liz and the other 8 lovely participants. This week I had the pleasure to talk to John Roberts about his time in China and talk about the differences between the European upright marionette control and Chinese paddle control. They have a huge number of strings which means they can have things like hands that can pick things up. 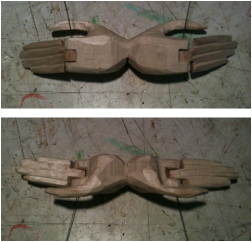 Heres my attempt to make a pair of hands. 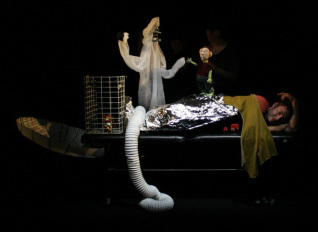 Below is a video of some in action - I found myself watching the puppeteers almost as much as the puppets. their choreography is so tight - it's not often you get to see marionettists in action. The Chinese marionette below is by John Roberts from puppet craft - my photos don't do it justice in anyway but it shows what they are like on the inside. I was a little suprised by how simple they construction methods were - rolled newspaper for arms - just cloth legs but the costumes and paint are so intricate and then you get to the stringing and discover that she is anything by simple. I've been experimenting with an eye mechanism. Might come in handy when I need a shifty character. This one is a pretty basic toggle directly attached to the back of eyes on a pivot. It took some trial and error to see what would work but was really interesting to try of lots of different things until I got the movement I was after. 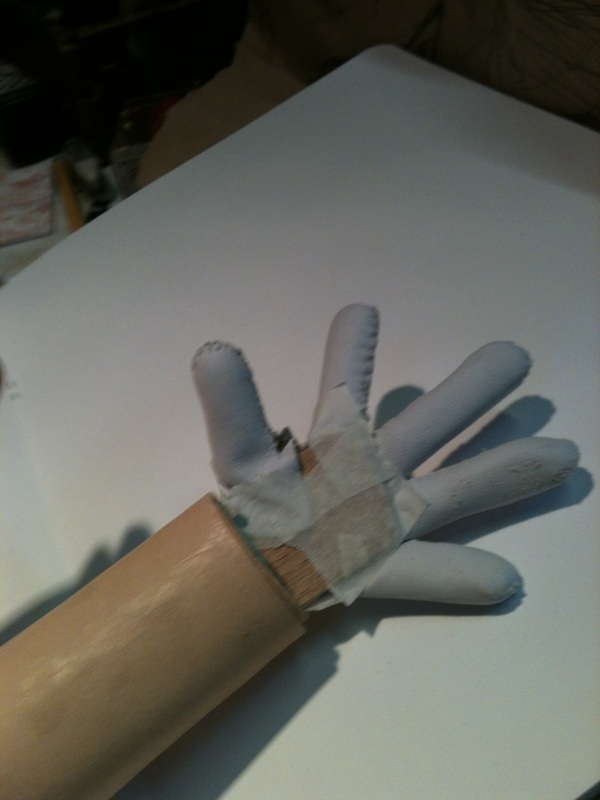 Whilst I was playing with eyes Lyndie was trying out a type of javanese puppet hand she's not made before to see how it worked. it's a solid piece with fingers joined. it's strong but also quick (comparatively) to carve because the thumb is inline with the rest of the hand. 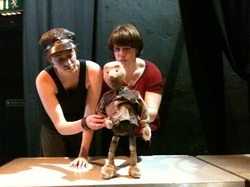 Lesson of the day: Even after 50 years in puppetry there are still new and exciting things to try for the first time. 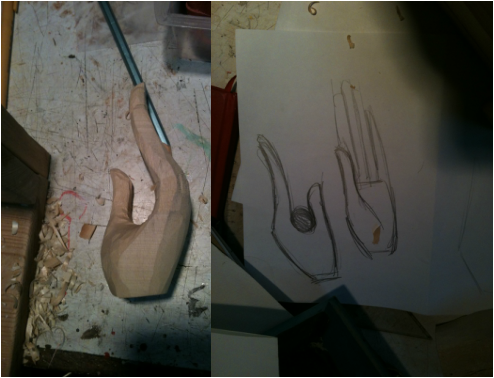 I've been experimenting with leather and making glove puppets. Everything I did with this is completely new to me. 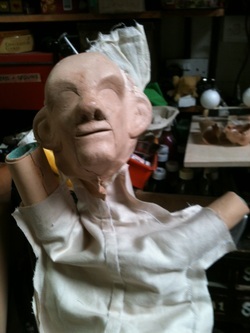 the head is one piece stretched over my carved marionette head and the arms are a thicker leather lined with felt. He's even leather right down to his fingertips. Have you seen a bear? You can now go and see We're Going on a Bear Hunt. 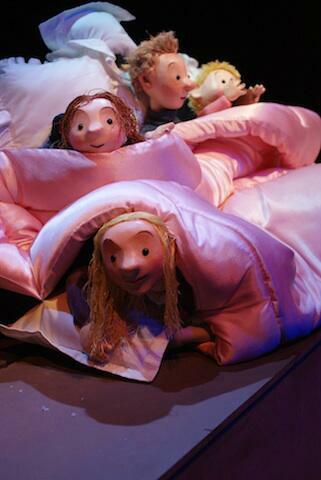 Little Angel Theatre from today until the 21st July. 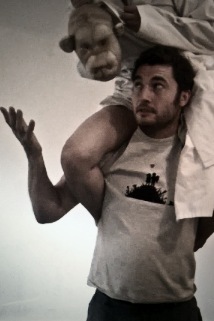 Remember that sneak peak from March? This is what the extra puppets were for. Photos in this post are from the Little Angel Theatre.